Dr. Abrams has provided professional care to thousands of patients of all ages. Because changes can occur in people's eyes as they grow older, it's important to have them checked regularly. Not only can vision weaken over time, but disease can set in, often without noticeable symptoms. Detecting and treating problems early is the goal of Dr. Abrams' comprehensive eye examinations. Combining the most modern technology with his specialized training, he performs a series of diagnostic tests in a comfortable and patient-friendly manner. Not only does he look for new conditions, he also compares test results with those from previous years and checks for subtle differences that may be important. Why is an eye exam required? You will require an eye examination so that your optometrist can treat any issues with your sight or eye structure immediately. You'll learn how to keep your eyes healthy for your entire life from the optometrist. Thorough exams are encouraged every year for children and adults alike. If there is a condition with your eyes, like a lazy eye, or if you wear glasses, you might have to visit your optometrist more often. It's also worthwhile to have ongoing visits if you have chronic health conditions (because you might be more susceptible to sight issues). It is also wise to tell your optometrist if your loved ones have a history of sight issues so they can track your eye health more comprehensively. What does an eye exam consist of? To enhance vein visualization in your retina, eye, and optic disk, your optometrist might give you some eye drops. As per the test results, your doctor might say no further treatment is necessary, recommend modifying an existing prescription, prescribe corrective lenses, change your current prescription, or suggest additional evaluations. You are encouraged to bring your contact lenses or eyeglasses to your exam if you wear them. What if I prefer contact lenses? Tell the experts at Dr Brian Abrams to book an evaluation after your eye exam if you desire contact lenses. To maintain your healthy eyes and clear vision, book an eye exam at Dr Brian Abrams by phone or online. We can treat most sight issues for adults and kids. In some instances, we might send a patient to a local eye surgeon to help us treat the condition. It is estimated that one in 6 children have a vision-related problem which may affect their ability to learn. Dr. Abrams believes it is important to detect these vision problems before they affect a child's progress at school. As the father of two young children, Dr. Abrams has developed a relaxed and welcoming approach to comprehensive eye exams that readily puts young people at ease. Dr. Abrams recommends that all children have an eye exam by the age of three. Kids and adults alike can depend on the eye care provided by Dr. Adams for results and compassion. 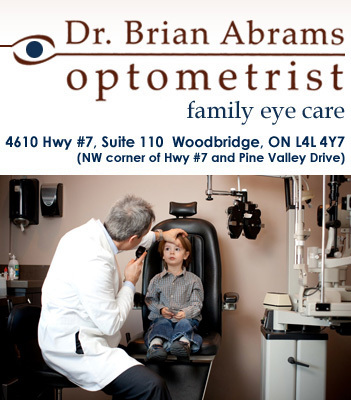 Contact us in Woodbridge at 905.850.2400, or use our handy Request an Appointment form online to book an appointment with a pediatric optometrist. We treat child and adult patients from Vaughan, Woodbridge, Concord, and Claireville.